Like others Involved in the political movement of Autonomia in Italy during the 1970's, he fled to Paris, where he worked with Felix Guattari in the field of schizoanalysis. 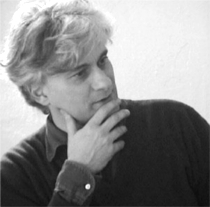 During the 1980's he contributed to the magazines Semiotexte (New York), Chimerees (Paris), Metropoli (Rome) and Musica 80 (Milan). His recent published works include Ethereal Shadows (New York, 2007), Felix Guattari (New York, 2008), Precarious Rhapsody (New York, 2009), The Soul at Work (Los Angeles, 2010) and After The Future (Edinburgh, 2011). I never met Aaron Swartz, but he was my brother. TODAY #7: a publication by Through Europe. Featuring articles by Federico Campagna, Toby Austin Locke, Paolo Mossetti, Franco Berardi Bifo, Nathan Witt. Freely available here.